As someone who’s always been passionate about reading, I must admit there’s much I love about the digital media revolution: the plethora of fascinating blogs, e-books, and curated websites, the search engines that make information so easy to find, and the handheld devices that allow me to carry a whole library in my purse. But sometimes there’s nothing like curling up with an actual book — savoring the weight of a heavy volume in my lap, the touch of a well-crafted hardcover, and the scent of ink and paper. As you walk through the door, you find yourself surrounded by “the new.” To the left, there’s a wide table bursting with recent paperback editions of the most currently popular classic fiction titles, all placed next to the latest bestsellers. 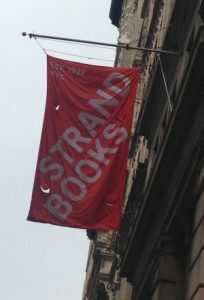 The Strand Book Store price of any book is typically lower than the list price for the same edition, so it’s definitely worthwhile shopping. You’ll also find recent non-fiction, not to mention all the whimsical bookbags, gifts, and apparel. There’s even a table dedicated to “Real Books Cheaper Than E-Books” where, for example, I felt very tempted to purchase a paperback copy of David McCullough’s 1776 that was shown to be much less than the current Kindle price. As you make your way deeper into the store, you find shelves and shelves filled with both new and used books. The used books are often some of the best deals, but what the store has in stock is continually changing, so you never know just what you may find. I’ve been known to get lost for hours browsing through the stacks of fiction, poetry, drama, history, and culinary books on the first floor. Downstairs in the basement, there’s business and economics, philosophy, social science, psychology, science and math, health and medicine, sports, foreign language instruction, and – one of my personal favorite categories – travel books. Head upstairs to the second floor to find exquisite monographs in the arts, crafts, and architecture, as well as graphic novels and comics. There’s also a whole corner just for kids, where on weekends you can enjoy “Story Time” events for the whole family. 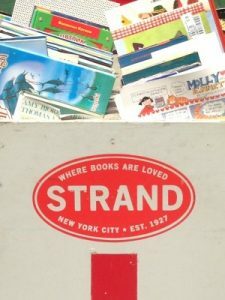 Psst – if, however, you are looking for Strand Book Store’s true gem, let me tell you, it’s a little bit hard to find. I had made visits to the store for years before I finally got clued in. You actually have to take the elevator and ride it all the way up the third floor. And there you’ll find it: the Rare Book Room. As you step off the elevator, look to your right and there, locked in protective glass shelves, some of the world’s most valuable books are on display before your eyes. There are classics, such as a first edition of Joseph Heller’s Catch-22. There are also contemporary delights, like a signed edition of J.K. Rowling’s Harry Potter. Some of these books are for sale at hefty prices that speak to their status as collectibles. 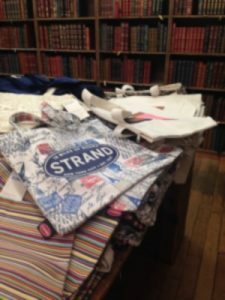 But Strand Book Store also prides itself in making rare books accessible. So, not only are you able to browse and handle many of the old books that fill the third-floor shelves, you will find rarities available at all price points. If you’re very lucky, one of the floor’s four large brown leather chairs will be unoccupied – and you may just find yourself sitting next to me, quietly lost for hours and happily absorbed in an old book.